Dr. Melver examines Leah for fragile X syndrome. 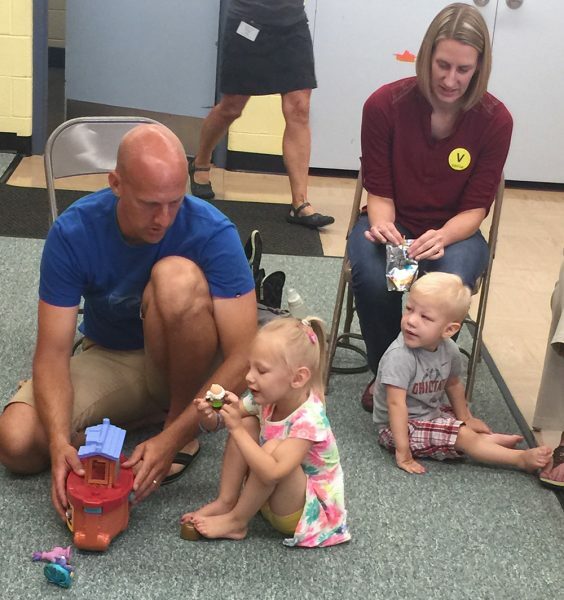 On a recent Friday, Akron Children’s geneticist Catherine Ward-Melver, genetic counselor Susan Woods and developmental pediatrician Dan Smith traded their hospital exam room for a brightly colored classroom at Portage County’s Happy Day School. Dr. Melver has been holding a genetics clinic at the school twice a month for the past 10 years, with the support of a grant from the Ohio Department of Health. On this particular day, Erin and Curtis Ahrens were there to learn more about their 22-month-old son Evan’s diagnosis of fragile X syndrome and whether their daughter, Leah, 3, has a milder form of the syndrome. This was their third clinic visit. Their first visit was prompted by concerns about Evan’s development when he wasn’t sitting up by himself. In taking the family history, Susan learned that Erin had a brother with developmental delays. DNA testing revealed that Evan was positive for fragile X syndrome with some fragile X cells and some normal cells, referred to as mosaicism. At their next visit, they learned what these results meant for Evan and other family members. Fragile X syndrome is an inherited condition that causes a range of developmental, learning, social and behavioral problems and various physical characteristics. Males are more severely affected than females and one-third of kids with the syndrome have autism spectrum disorders. The syndrome is caused by changes to a person’s fragile X retardation 1 (FMR1) gene. The FMR1 gene usually makes a protein needed for normal brain development. But with fragile x syndrome, the gene doesn’t make this protein. 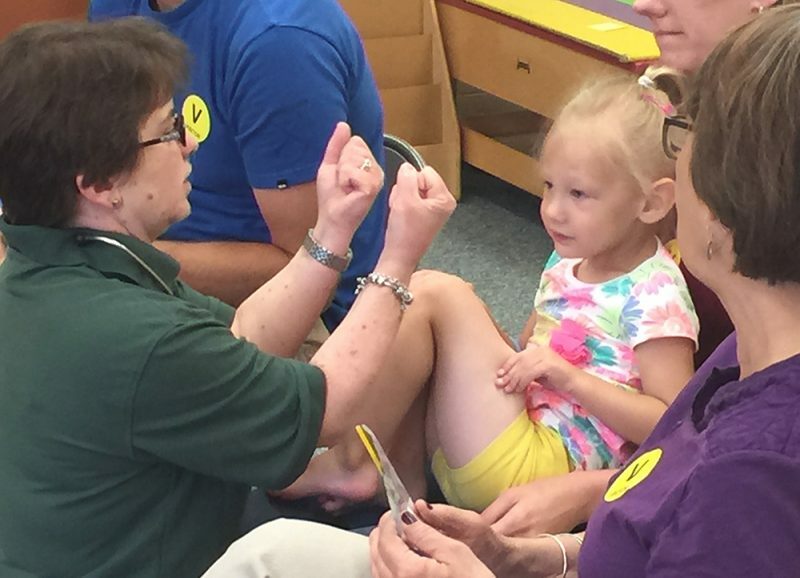 A major force behind the scene is clinic coordinator Jen Manthey, a licensed school nurse. Curtis plays with Leah with Erin and Evan nearby. Since opening the clinic at Happy Day School in 2006, Dr. Melver has seen a rapid increase in diagnostic tools, especially for kids with intellectual disabilities. She tells the Ahrens that because we know the diagnosis we can watch for specific developmental signs in Evan. Unresolved questions for the team include: What does the mosaicism mean for Evan? Will he be mildly or more severely affected? Does Evan’s sister Leah have a fragile X mutation? Evan’s dad, Curtis, also wants to know what they can do to help Evan now, especially in the area of speech. “He is good with recognizing words, just not saying them,” Curtis said. Dr. Smith suggested they label everything Evan comes in contact with – his bottle, toys, furniture − so he could practice words in everyday use. The Ahrens also questioned Dr. Smith about IQ testing. Dr. Melver examines Leah while she sits on her mom’s lap. 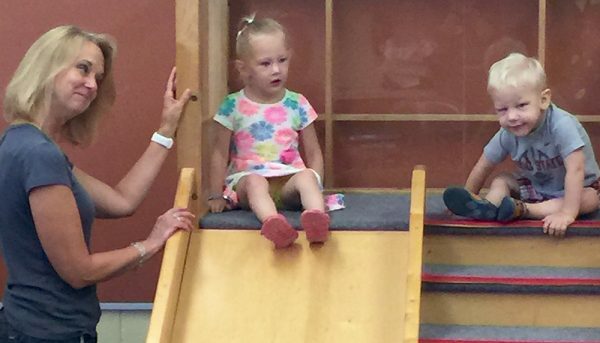 Next, they shifted their focus to 3-year-old Leah, who seemed happier on the slide with her brother than being examined. 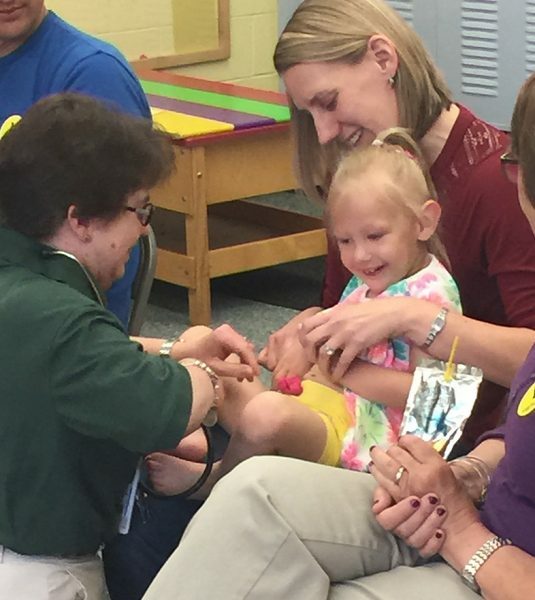 Dr. Melver conducted the exam from her knees while Leah sat on her mom’s lap. Leah is in the “gray area” for physical development and language skills. Erin and Curtis agreed to get Leah tested as soon as possible, not only for preschool planning but so they can watch her development and be more proactive. But like many parents, they share concerns about the costs of genetic testing. Susan explained that the staff will pre-authorize testing with their insurance company and even write a letter of support if necessary.